Webster University’s Department of Dance presents its student choreographed concert March 29 and March 30 at 8 p.m. in the Jean and Wells Hobler Center for Dance, on the second floor of the Loretto-Hilton Center for the Performing Arts.Come support our students in thei.. 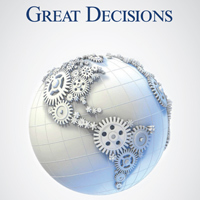 Alumni, students and members of the Webster Community are invited to participate in the 2019 edition of Great Decisions, the ever-popular series of current events, presentations and discussions led by Webster University faculty and sponsored by the Webster University Alu.. The Webster University Conservatory of Theatre Arts presents "By the Way... Meet Vera Stark" Feb. 13–17 and Feb. 20–24 in the Emerson Studio Theatre. 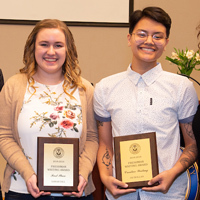 The story draws upon the screwball films of the 1930's to take a funny and irreverent look at racial stereotypes in H..
Congratulations to this year's Freshman Writing Award winners, who were celebrated at the event's 14th annual ceremony and luncheon sponsored by the Academic Resource Center. The 1st-place winner was Sarah Hill for her essay, "U.S.-Russia Nuclear Pact and The Blame Game," for Kelly-Kate Pease. The Creative Writing Award winner was Jai Bollan for his essay, "The Validity of My Humanity," for Kate Parsons. The search committee for the dean of the Leigh Gerdine College of Fine Arts is pleased to announce the dates for the campus visits of four final candidates. The dates and times/locations of the open sessions for Webster community members are April 25, May 2, May 8, May 9. The Academic Resource Center (ARC) encourages students to begin preparing for the end of the semester now. The ARC is a great place to get assistance with writing, testing and tutoring. It also provides access to computers, printers, and other resources and to study and complete assignments. All ARC services will be available through finals week, May 6-10. On Friday, April 12, Winning Approaches for Talented Transfers in STEM (WATTS) Scholarship recipients and additional science majors participated in a Career Development Employer Tour coordinated by the Career Planning & Development Center and Biological Sciences Department. Students visited BioSTL and MilliporeSigma, where they were able to meet with scientists and gain insight into careers and the growing science start-up community in St. Louis.